Exclusive! Pintucked top of sheer polyester chiffon. Our Floral Watercolor Chiffon Top features three-quarter roll-up sleeves and hi-lo hemline adds to the charm, including a front tie closure. Machine wash. Imported. Misses, approx. 25"l at front, 28"l at back. 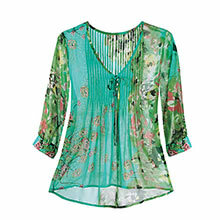 This is a beautiful blouse...I have gotten so many compliments on it. It does need a tank underneath. I got a low-cut tank the same turquoise as the blouse and it looks GREAT !